As long time followers of Mapleton's know, Ineke (Martin's wife) was the driving and creative force behind the birth of Mapleton's Organic. It was a cold winter night in the 1980s when Martin and Ineke argued about whether to continue farming conventionally or to transition to organic. The book "Small is Beautiful" by Robert Schumacher was the catalyst for the discussion and ensuing disagreement. Neither one to back down, the fight ended with Ineke throwing the book in the kitchen woodstove, exasperated with Martin's hesitations. Martin wryly remembers that the book created even more heat in the house that night as it burnt. Ineke was a determined woman though, and eventually Martin conceded and the farm began to transition to organic practices in the early 1990s. Looking back Martin recognizes it was one of the best decisions of their lives. After transitioning to farming organically, it was then Martin felt like a food producer rather than a commodity producer. On the farm, Martin & Ineke worked together. Ineke was involved in all aspects including feeding the cows and calves, milking and feed work. She was a Mom. Four active children kept her and Martin on their toes. In addition to this, Ineke was very active in various organizations. These included the Toronto Food Policy Council , the Ontario Federation of Agriculture (before transitioning to organic), the National Farmers Union – Local and National branches, the Farm Women's Network, and others. Her work with these organizations was substantial. She travelled internationally on a number of occasions to countries such as Jamaica, Mexico and Japan. Not only did Ineke's volunteer contributions speak to her desire for positive change in the world, but also matched well with her curiosity, excitement to try new things and her love of people. Martin recalls attending conferences and meetings with her. "When we walked in the room, everyone knew Ineke – she was the social one - connected with everyone, and I was in the background." "They could have met me 10 times . They would meet Ineke once and remember her. She would talk to everyone. Ineke could be really good with people – always interested in what they were doing and talking with them. Combined with her bright red hair, she was pretty memorable." At other times, Ineke's determination and stubbornness shone through as she was not one to back down – at home with Martin, or in professional settings either. It was this drive and passion that kept Ineke looking to the future and building an ever stronger, more independent farm. In the late 1990s Ineke started looking at products that could be produced on-site. Various options were investigated, with cheese and ice cream being the final two options to choose between. After much consideration, and some more very heated debates, it was decided to make ice cream. Cheese was a more natural choice for Martin, who grew up in Holland surrounded by farms, many of whom made cheese. Ineke was creative, and thought ice cream would be more fun. A market research survey completed by the University of Guelph supported ice cream as the preferred product as well. "I lost and she won as usual," remembers Martin. There was a lot of work involved before Mapleton's started making ice cream. Ineke attended the world renowned ice cream making course at the University of Guelph by Professor Douglas Goff. The plant was built and equipment was sourced. Initially most of the equipment was used, and although one tank that was needed was purchased from a neighbor, most items came from further afield. Quite a bit came from Holland, some from Germany and other pieces from Quebec. A very handy neighbor was key to putting it all together. The harder parts were deciding on the brand name, designing the packaging and setting up distribution. "After 2 years of preparations, courses and construction Ineke was quite elated about the first batch coming out," remembers Martin. "It was ready on May 5th, 2000 at 4pm. It was vanilla and it took 24 hours to make." 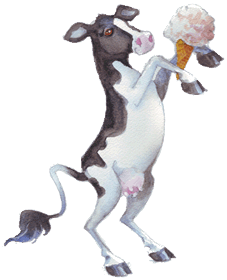 Ineke managed ice cream production and the office at this time and wasn't as involved with the farm itself. She managed the production staff, oversaw distribution to retail stores, looked after the bookkeeping, worked on recipes for new flavours, and travelled to trade shows to promote the products... just to name a few of her tasks. It was also around this time that planning and construction of the on farm store was started. It opened in 2005 and was also looked after by Ineke. Over the next couple of years from approximately 2005 to 2007 things started to change for Ineke. She became forgetful – not remembering things, getting lost when she went places, not always understanding where she was. She would have drastic mood swings. Her comments and behaviour in public could be inappropriate. Doctors and psychiatrists were consulted. They thought Ineke was depressed, overworked, maybe bipolar. Ten years after the initial concerns began appearing, Ineke received a diagnosis. In 2015 Ineke was officialy diagnosed with Left Frontal Lobe Dementia, a rare type of dementia. This form of dementia is also called frontotemporal dementia or alternatively, Pick's disease. The diagnosis was welcomed, although with a mix of emotions. Finally an official name, some kind of validation for what Ineke, Martin and their family had been experiencing. At the same time, it confirmed an uncertain and difficult future. It is extremely difficult, in a variety of ways, to see someone so very dear experience the challenges of dementia. There is the loss of that individual. Loss of a wife and partner for over 40 years. Loss of a mother to four. There are challenges in supporting and caring for the individual who continues to live on, although in a very different state of mental and physical abilities. It hasn't been an easy journey as Ineke's dementia has worsened. Communication problems like forgetting how to speak English, and reverting to speaking only Dutch. Losing the ability to do simple, familiar activities such as collecting eggs and stacking the trays. Personal care challenges such as putting on clothes backwards or losing dentures. Disturbed sleep patterns – waking up in the night and not understanding why it's dark. Hallucinations and anxiety about people in the house. For the majority of this journey Martin has been Ineke's main caregiver, with additional support provided from family members and personal support workers. In early November of 2017, the difficult decision was made for Ineke to move from the farm to a long term care home in nearby Palmerston. Some have felt more comfortable than others with Ineke's dementia. As with mental health in general, it can be difficult to talk about these issues. "I was never embarrassed to talk about it," says Martin. "For many people it was uncomfortable to talk about it, or ask how Ineke was doing. Some friends became better friends. A lot of friends disappeared." "As people and a society we need to learn and accept illnesses like dementia. It's important to help the person with dementia, and also the people surrounding them – to keep them from being isolated." "I'm not blaming people," emphasizes Martin, "but hopefully people will read this and become more aware of how we all react to these kinds of situations. Maybe next time you experience a situation like this you'll feel more comfortable." Martin has also found a new mission in life – to keep talking about his experiences as a caregiver and continue to educate and support others. 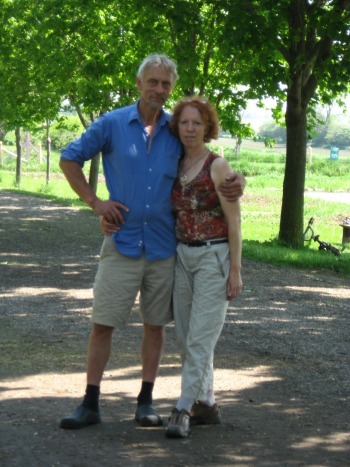 Although the demands of the farm are significant, it provided good social support for Martin and Ineke on their journey. Staff to interact with. Many visitors in the warmer months. Interns living on the farm and sharing meals and evenings together. 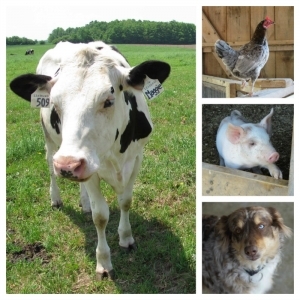 In recent years when she was able to, Ineke especially enjoyed all of the visitors to the farm. Often greeting them, smiling and chatting away - although sometimes having a hard time expressing herself, and often speaking in Dutch. Through all of this, glimpses of Ineke's spirit have shone through. 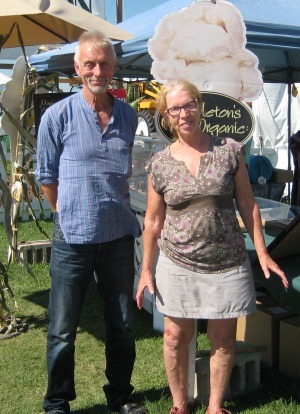 At Mapleton's we have, and will continue to move forward and look to the future, but we also wanted to highlight Ineke's importance in establishing Mapleton's Organic. She was very happy and proud that Mapleton's was farming organically. And we know she loved that so many people visit the farm, getting more connected to their food, the outdoors and agriculture. Thank you for being a part of Mapleton's. And thank you for joining us at this time to reflect on the amazing influence of Ineke at Mapleton's and beyond.